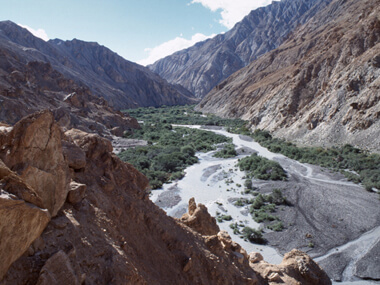 The Markha Valley Trek is certainly one of the most varied and beautiful treks in the world. It ventures high into the Himalayas crossing two passes over 15,000 ft (4575m) as it circles from the edges of the Indus Valley, down into parts of Zanskar, and passes through terrain that changes from incredibly narrow valleys to wide-open vast expanses! It is made all the more interesting by the ancient form of Buddhism that flourishes in the many monasteries that dot the landscape perched high atop hills. The trails are decorated by elaborate “chortens”(shrines) and “mani”(prayer) walls, which further exemplify the region’s total immersion in Buddhist culture. As we trek to the upper end of the Markha Valley we are rewarded with spectacular views of jagged snow capped peaks before crossing the 15,500-ft (5000m) Gongmaru Pass and descending to the famous Hemis Monastery, where we end our trek. There are chances to see Himalayan Animals & Birds on this trek as it lies in Hemis National Park . (Snow Leopard, Himalayan Red Fox, Himalayan Wolf, Lynx, Blue Sheeps, Yaks, Himalayan Hare & Marmots. Drive from Leh by Jeep to Spituk village. Visit Spituk Monastery. TREK STARTS. Trek to Zinchen, which is an easy walk, and have river crossing 3 times. Overnight in camps at Zinchen village. Trek time: 04 /5 Hrs. Start trekking for Kanda-La base, which is a little hard trek having river crossing few times. Stop for lunch at Rumbuck village. Overnight in the camps at the Base. Trek time: 6/7 hr. A walk along the mountainside up to the Kanda-La, which is situated at the height of 4850, Mts. Further an easy and decent walk towards Shingo village. After easy walk camp at Skiu. Visit the Skiu Monastery. Trek time: 5/6 Hrs. Today we have several river crossings but the trek is easy. Trek time: 7 Hrs. Evening explore the local village on a cup of tea with the locals. O/n Camp. 05 MARKHA - THACHUNGTSE. (12300ft / 3700Mts). Enroute visit Hankar Yokma village & Umlung Monastery on a hill top, One can have very nice view from the monastery. Cross 2 times Markha river Trek time 5 hrs. Overnight at camp. A bit beyond Thachungtse leave a broad valley on the riverside. The valley narrows and goes higher. The river is far to the left. Walk near a small lake, and cross pastures to Nimaling. This one of the most beautiful high valleys of Ladakh, which is on the height of 4700 Mts. On the right side stands the Kangyatse Peak 21000 Ft. Trek time: 5 – 6 Hrs. O/n Camp. Long climb along the mountainside then Zigzag up to the GONGMARU LA at the height of 5150 Mts. Several easy steam crossing. Trek time: 5Hrs. Overnight at Camp. 08 SHANG SUMDO – MARTSELANG – HEMIS - LEH. (12078 ft / 3660Mts). Take the riverbed again, then a good footpath through large blocks. You reach the motorable trail pass a series of Chortens. Leave Martselang village on the right and follow a gentle rising trail to Hemis. Trek time: 5/6 Hrs. Trek Finish. Visit Hemis Monastery and drive back to Leh 01 Hr.